Click here to claim Best Inspirational Quotes. What can be a better way to start your day than with a powerful dose of inspiration? Speaking Tree brings you positive thoughts and the best inspirational quotes from eminent spiritual masters. These inspirational quotes not only promises to lighten and brighten your day, but the wisdom hidden in them will guide you on the path of a gratifying life. o	Whether it’s the long bus journey or snarling traffic on your way to work, you can keep yourself refreshed by reading these free quotes on the go. o	What’s more: The app is accessible even without an Internet Connection. 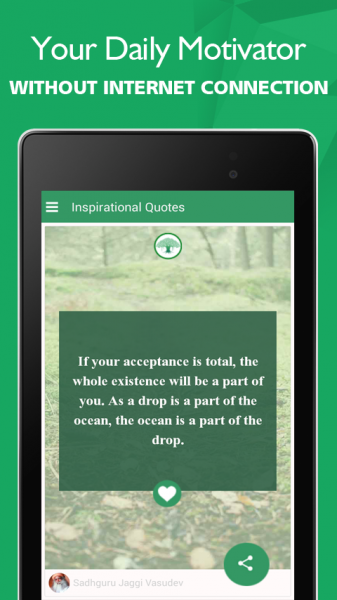 All you need to do is download the app and access some best inspirational quotes offline…anytime, anywhere. o	Liked a quote? Would love to read it time and again? No problem, you can add it to your Favorites list and access it anytime you want! o	The serene pictures behind the inspirational quotes create a soothing effect on your mind – and you can also set them as your Mobile wallpaper! Now, how cool is that? o	Spread the wisdom by sharing these inspirational quotes with your friends via Facebook, Whatsapp and text messages. One look at the internet and you can be flooded with infinite number of motivational quotes, but none of those really strike a chord in your heart. 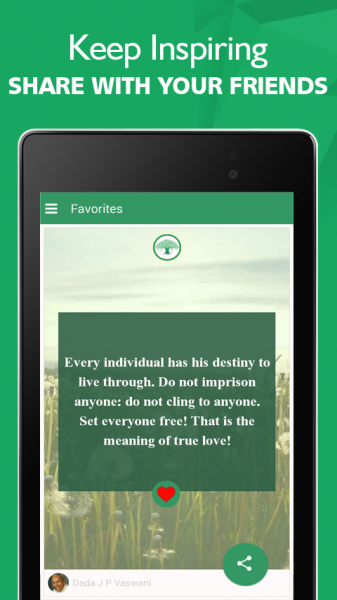 These positive quotes that this app brings to you comes right from the distinguished maters who have attained superior spiritual levels. Each one of us have our own unique battles to deal with! Sometimes we win, sometimes we lose but sometimes we just stop…and start questioning whether life is worth all the hullabaloo, this is when we start looking for some profound wisdom that can show us the light. In this hour of need, this app brings you motivational quotes that can bring zing back into your being. 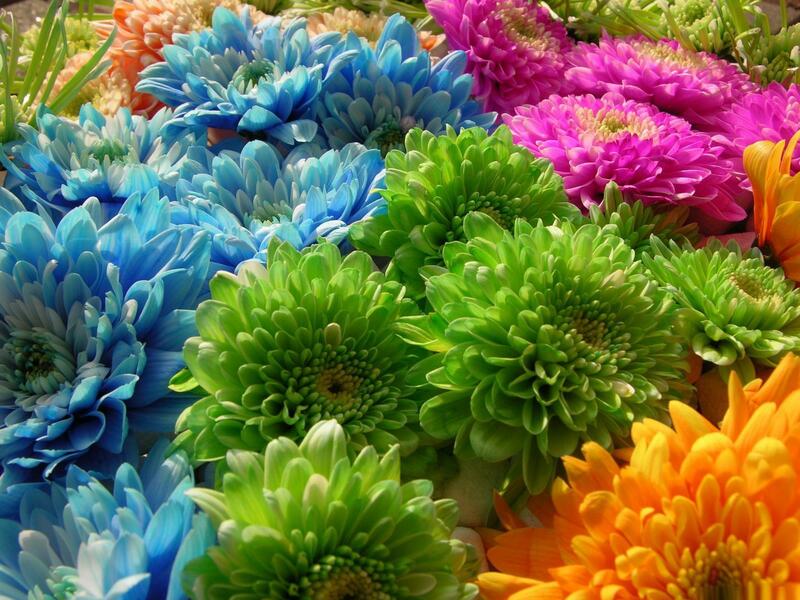 These positive quotes provide you food for thought and uplifts your state of mind. 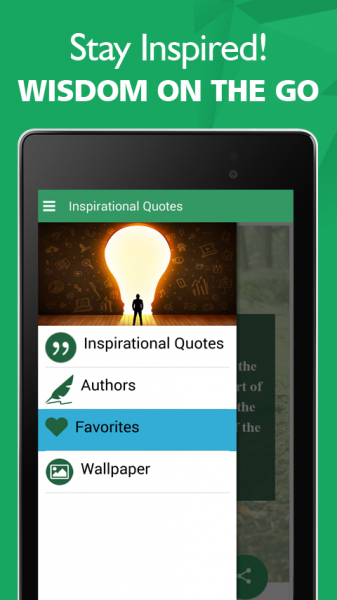 This is an extremely simple but very valuable inspirational quotes app that promises you thousand of motivational quotes. With these best inspirational quotes, you can not only keep yourself in high spirits but also understand the deeper meaning of life. 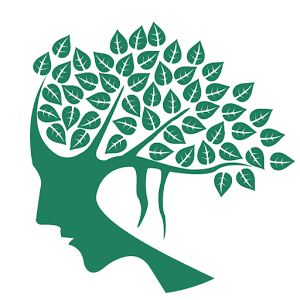 With Speaking Tree’s Thoughts app, you can read daily, free quotes right in the morning and that would be enough to stimulate you throughout your day. So if want to stay inspired, download the best inspirational quotes app and open the door to positivity in your life! 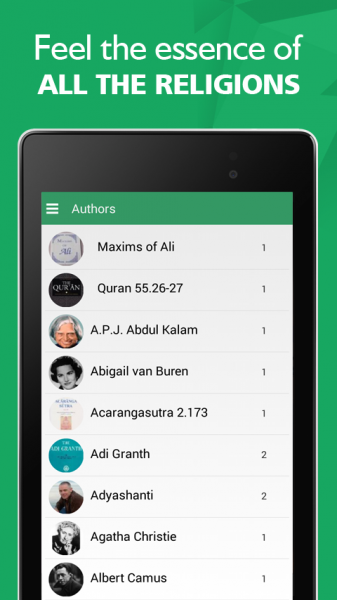 Download Best Inspirational Quotes from these app stores today.